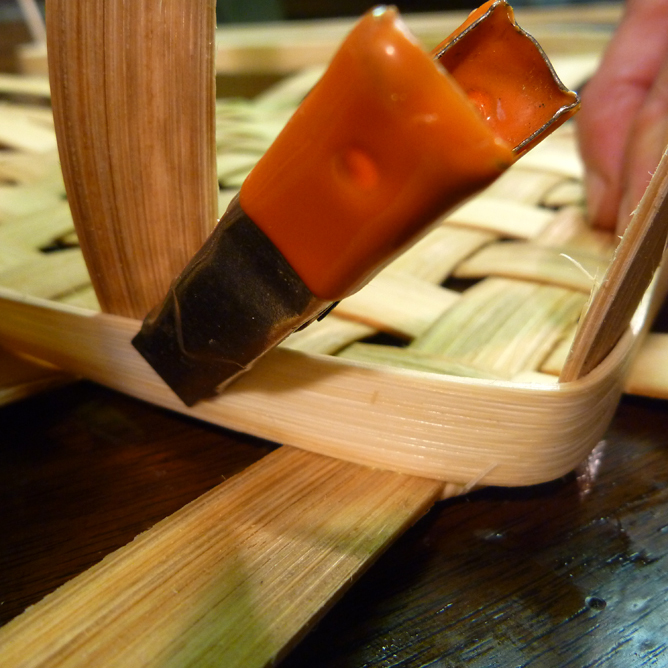 Step 1: Soak the weavers in warm water for several minutes until they are pliable. 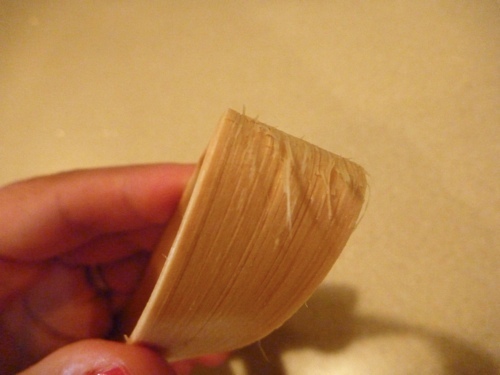 Find the rough side of a weaver by folding it slightly to see which side has splinters that pop up. and 2) at least four stakes away from the right corner of the basket. 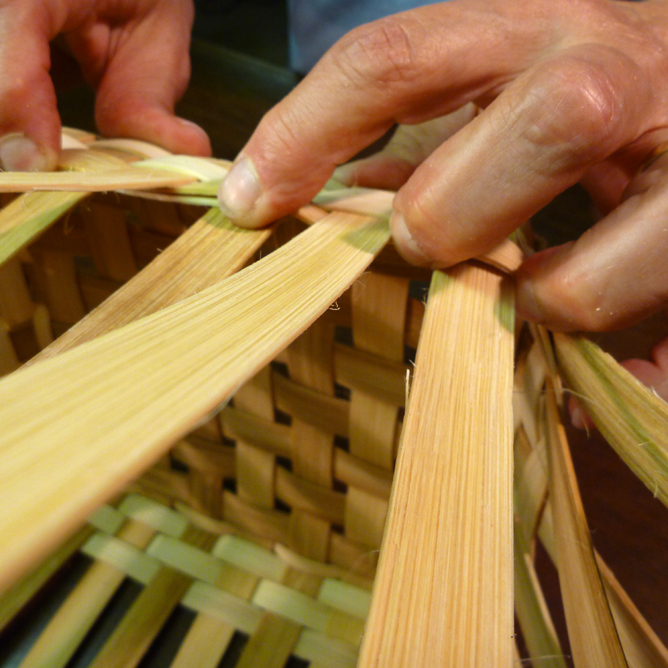 Your long weaver tail will be working toward the right of the basket. Clamp it in place with a hippo clip or strong clothespin. 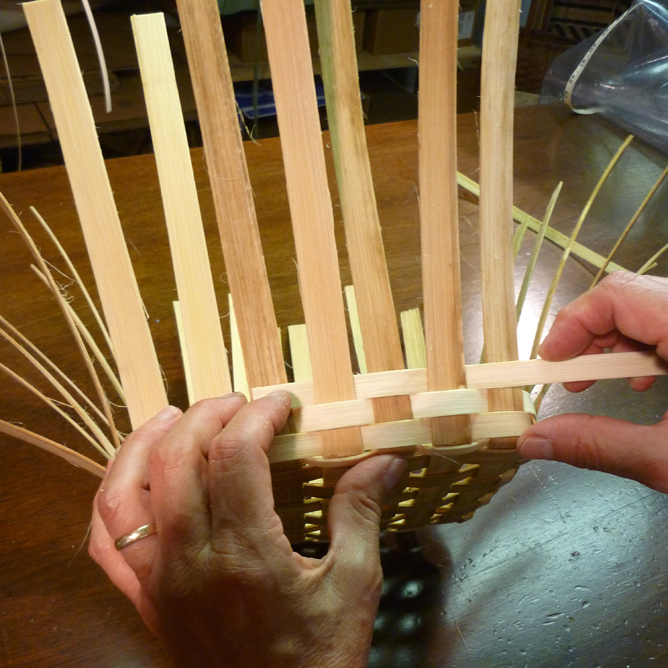 Step 3: Weave the reed in and out of the stakes, remembering to continue opposite of the locking row. 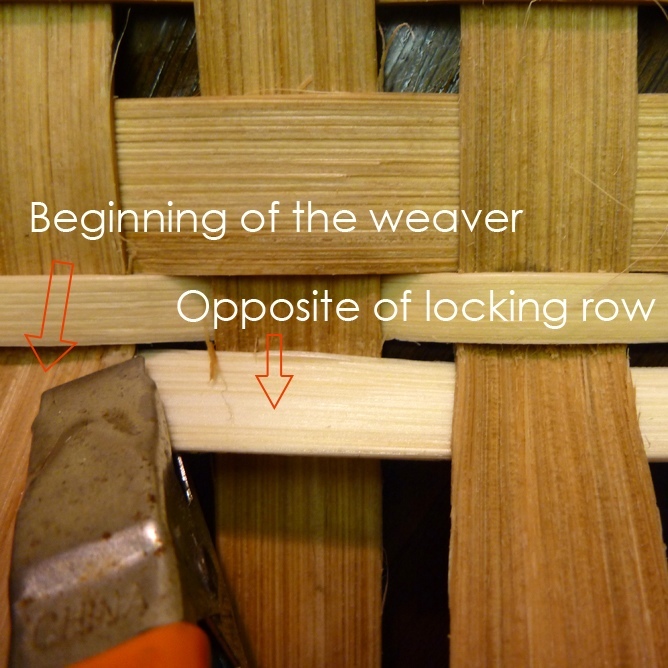 When you come to a corner, clamp the weaver in place and continue alternating in and out of the stakes. Continue around the base until you reach the beginning of the weaver. 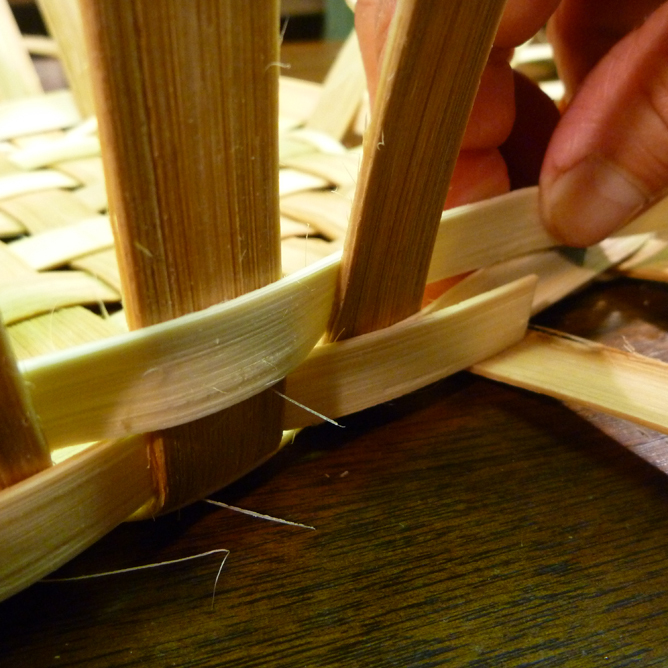 Step 4: Overlap the beginning of the weaver with the tail of the weaver by four stakes. 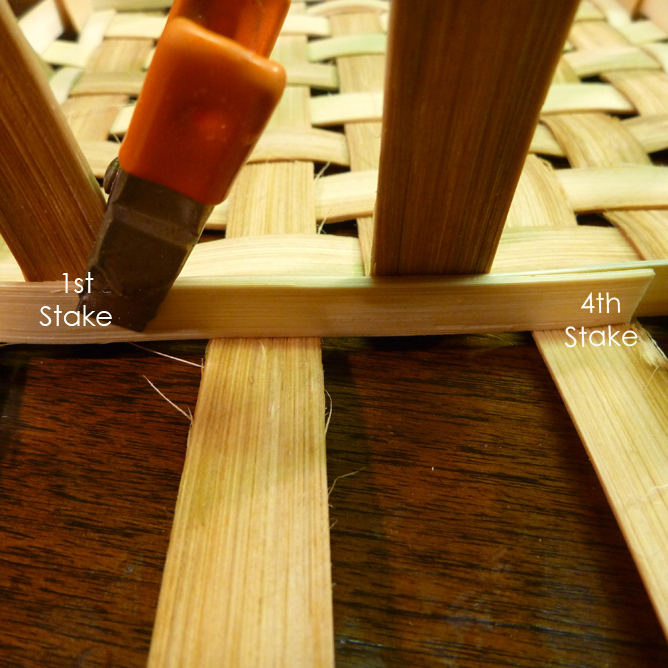 Clip the tail of the weaver so that it fits behind the fourth stake from the start. That overlap will be hidden once the stakes are standing upright. You won’t be able to see where the weaver started or where it ended. 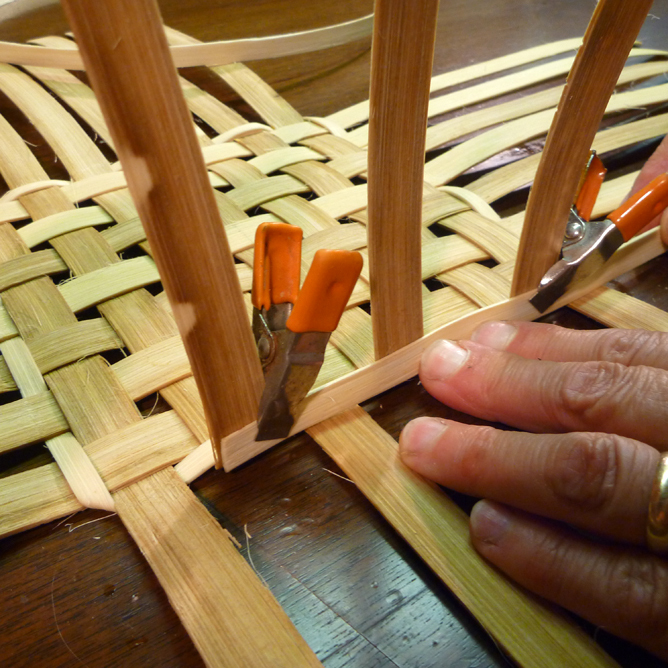 Step 5: Turn to the opposite side of the basket and repeat steps 2-4 to weave in the second row, third row, etc.. 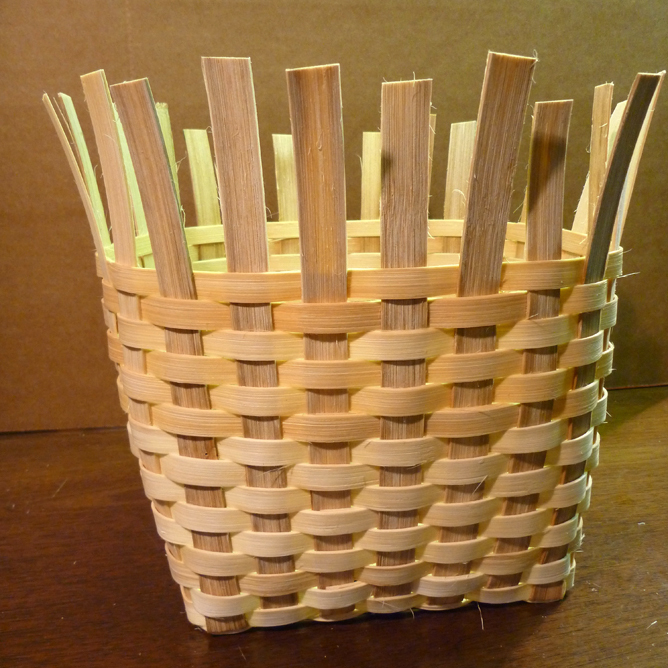 Pack each row down tightly as you proceed up the sides of the basket. 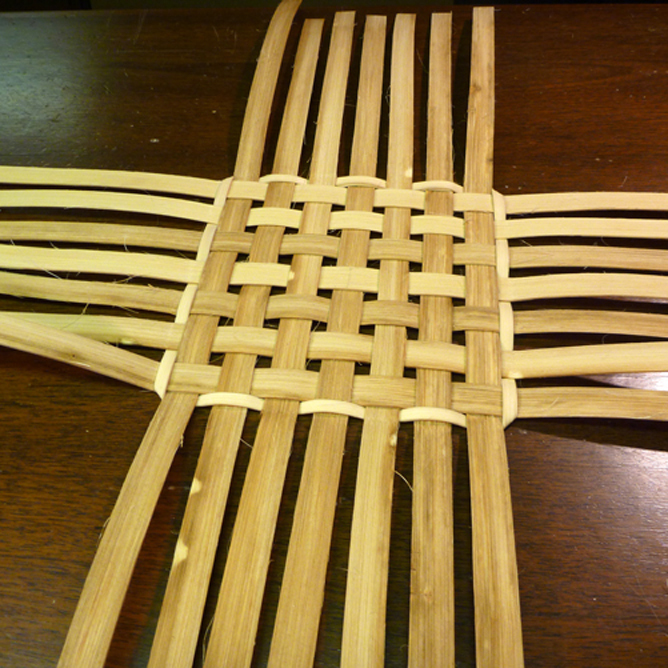 When you return to the place where you overlapped the previous row, continue weaving right over. This will pull the stakes into place and hide the overlap. 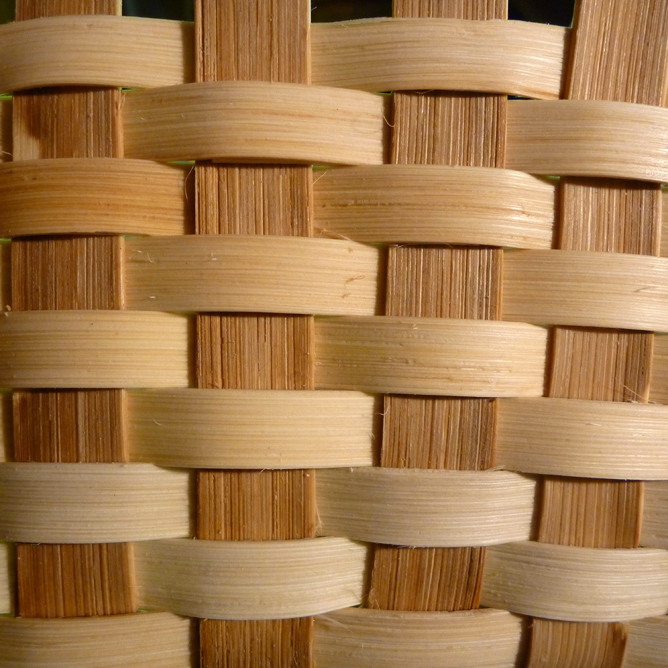 Remember to begin each row on alternating sides of the basket. 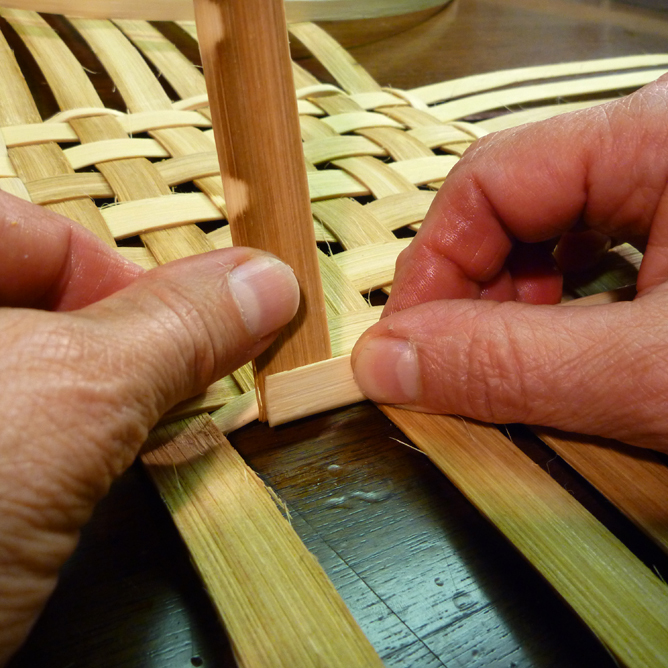 Once the sides become more firm, you can weave with the basket on its side rather than resting flat on the base. 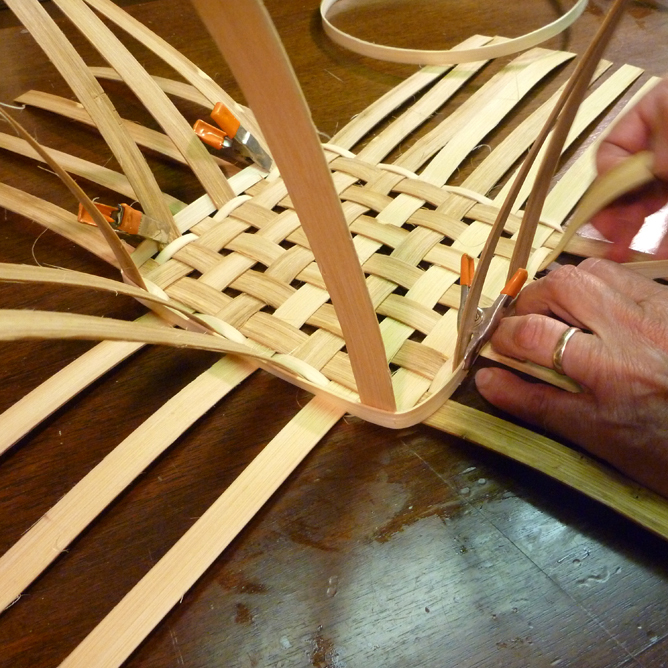 Weaving with the basket on its side makes it easier! Helpful Hint: In between rows, be sure to pack the rows down tightly. 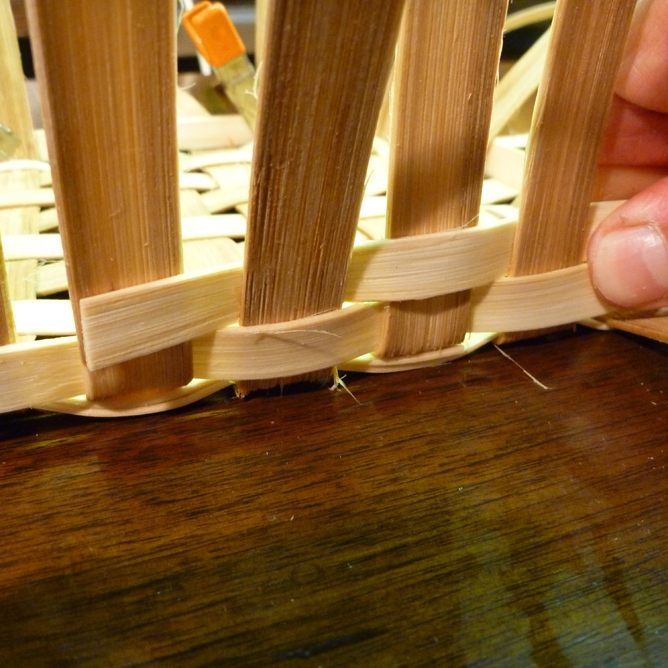 When the reed dries, it shrinks a little bit, so making sure the weavers are packed down will prevent spaces from forming in between rows. Weave as many rows as the pattern calls for. The next step is clipping and tucking - tutorial coming soon!